Ostia looks as beautiful as ever. The pines are tall and their shade inviting, providing cool spots from which to view the extensive ruins of the city. It is however actually not that hot. The thermometer is barely passing 30 degrees here, which is odd for this time of year. As a result of these lower temperatures we have been able to make a lot of progress removing last year’s backfill and devegetating the walls we wish to draw. This work re-exposes the white ‘tessuto’ which we laid down last year before re-filling the trenches with spoil. Removing this earth will allow us to follow up some unanswered questions and check details for our emerging report. Sadly the rains have washed some of the backfill away, and we can see frost damage that needs the attention of our conservator Ana Sanchez. 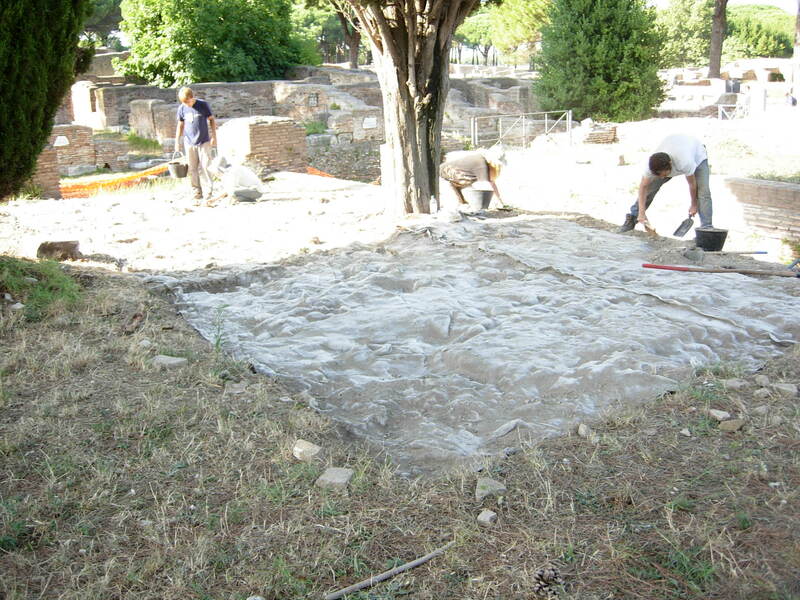 We hope to prepare a full conservation strategy for all excavated areas in the next few weeks, with the fragile late Roman temple of the palaestra being our first priority. We are currently working in the same areas as last year: the foro della statua eroica (a macellum) and the palaestra of the Forum Baths, with the Berlin team of Axel Gering working in the east portico of the main forum where the entrance to our macellum is located. This work is possible thanks to the collaboration of Professor Pellegrino of the Sopraintendenza di Roma, who is very supportive of our work. The removal of backfill can be a dull job, but not without surprises. 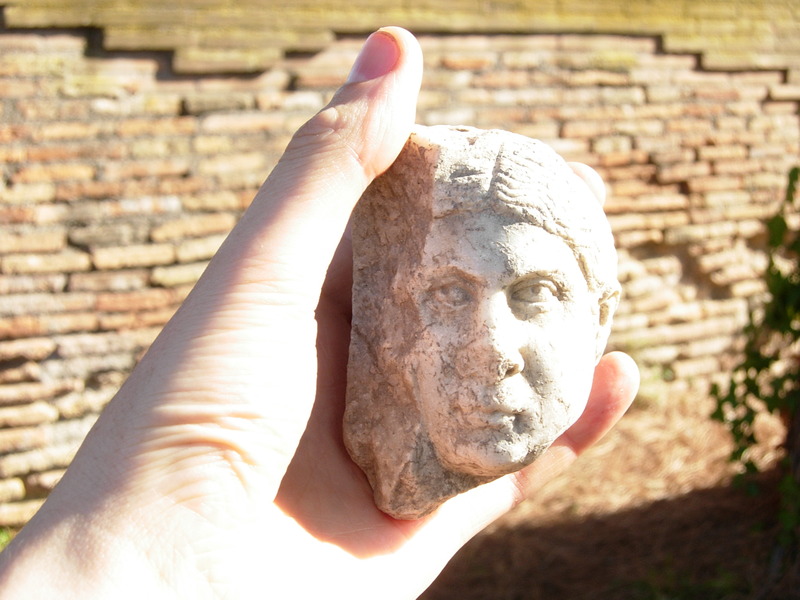 Bonnie Knapp happened to come across a spectacular find – a small female marble head – possibly from a sarcophagus fragment or perhaps a funerary stele. This was missed in the original excavation of dump levels in the north east portico, but has given the spirits of all of the diggers a bit of a lift. This random fragment – which fits comfortably into one’s hand, will be sent off to the museum, like all material of any note. A minor find for Ostia to be sure, of little historical significance, but enough to remind those clearing backfill that the story of the city is one of people, just not soil contexts, and that occasionally we can get close enough for them to look us in the face. More details on this find soon, when we have some analysis. I fancy it to be Late Roman on account of the upward staring gaze, but then again I know next to nothing about sculpture.